Last week was full of recovering from women’s retreat, starting back to work (full-time), and doing even more physical therapy exercises at home. My range-of-motion isn’t coming along as expected. It feels like I didn’t get much else accomplished. I did, but since I didn’t document it, I cannot remember know what it was. This week’s documentation is below. My goals are as follows . . . Walk 25 minutes 3 times a day. Do passive resistance exercises 7 times a day. Incorporate changes from Wednesday’s physical therapy appointment. Soak in hot tub or bathtub with Epsom salts 2 times a week. Attend pt at the doctor’s office twice. Transcribe notes from meeting with Pam and plan when to do what. Finalize summer second service schedule. Gather children’s church materials and print out lessons. Sort out 1st prepare/enrich meeting with new couple. Prepare notebook and address list for class members of Wednesday (66 Love Letters). Call women who didn’t pick up materials. Write out list of what needs doing. Check in daily with maximize your mornings group. Make annual physical appointment for Chip. Finish writing out details for summer bucket list. Your Turn . . . What are some of your goals in the area of exercise, work and miscellaneous? I participate in Goal Planning Monday so I’ll have a record of what I complete each week. I’ll also have a tool to energize my (sometimes) flagging motivation to complete (1) the jobs I tend to avoid or (2) jobs that get overshadowed by the urgent but not necessarily most important items on my to-do list. My Goal Planning Monday Goals are S.M.A.R.T. Does Making a List Really Make a Difference? Do you find that it makes a difference to use a list in terms of accomplishing your daily and weekly goals? It does for me. There are four reasons why I find it even more helpful if I make this list public. 1. It’s the accountability. I know that some of you will be checking up on me. And some of you even make reference to my goals when I see you. 2. I want to look good. OK, I admit it. I feel that if I don’t accomplish my goals that I am a flake. I don’t want you to think of me that way. 3. I make these public to-do lists more reasonable. Instead of trying to DO ALL the things in my head, I try to list those things that can really be done in one week according to the time, energy and resources I’ll have available that week. 4. Finally, the fact is I never lose this list. It is always available on the world-wide web. My paper to-do list often has other bits of information on it as well as doodles. Sometimes it is used as a coaster or impromptu plate for my peanut butter toast. It can get pretty full and tatty looking and ends up in the trash. Can you identify with any of these reasons? What would you add? Below are my goals for the week. Please share your weekly goals in the comments or write a post. Link up at Goal Planning Monday. Let’s see what we can get done together! Do passive resistance exercises 7 times a day. Incorporate changes from Monday’s pt . appointment. Finalize songs for Friday night. Print and put retreat booklets together. Decide and buy “decorations” for pail design. I may or may not get to this. Get my car from SF. Figure out what to do with Chip. How Realistic is Your To-Do List? Are You Doing What’s on God’s To-Do List? Click on the “more” button to see last week’s goals. on the whole i am pleased with last week’s goal completion. i did have a personal set back due to my in-home physical therapy. i was either doing the exercises incorrectly or too vigorously which resulted in a lot of pain for 3 days and no exercising (besides walking). i am back on track now and see the doctor on tuesday. below is my list for this week. please share your weekly goals with us in the comments. 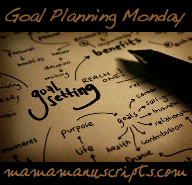 or write a post and link up at mama manuscript’s meme titled goal planning monday. I participate in goal planning monday so I’ll have a record of what I complete each week. I’ll also have a tool to energize my (sometimes) flagging motivation to complete (1) the jobs I tend to avoid or (2) jobs that get overshadowed by the urgent items on my to-do list. 3 weeks ago i fell while hiking. i broke my humerous bone just below the ball joint in my left shoulder. wearing this imobilizer makes it possible for my shoulder to heal properly because my left arm is tightly snug against my body. obviously i am not working at my day job. instead my main agenda for this week is to do things that help me heal quickly and well. i am also working one hour a day (from home of course). to things other than that, i am saying “no,” as i want to put my energies towards the “best” things this week. Katrina at Mama Manuscripts is hosting Goal Planning Monday. I am participating so I’ll have a record of what I complete each week. I’ll also have a tool to energize my (sometimes) flagging motivation to complete (1) the jobs I tend to avoid or (2) jobs that get overshadowed by the urgent items on my to-do list. what’s on your agenda for your health? for work? Go here to link up your Goals. Because yesterday was a holiday, today is my Monday. So today I am posting my Goal Planning Monday. But first, a review from last week. I did excellently except with walking. I need to figure out a way to make walking a part of my daily routines. (h) Walk 30 minutes (2 days) and chart progress on Idita-Walk site. “I implore you to see exercise (and life!) not as goals to accomplish, but adventures to experience. You’ll be amazed at what you find out about yourself” (Matt Frazier). What tips do you have for making exercise a priority? How have you managed to make exercise an adventure to experience? What 5 things do you hope to accomplish this week? Katrina at Mama Manuscripts is hosting Goal Planning Monday (GPM). I am participating so I’ll have a record of what I complete each week. I’ll also have a tool to energize my (sometimes) flagging motivation to complete (1) the jobs I tend to avoid or (2) jobs that get overshadowed by the urgent items on my to-do list. Her plan is to post 5 things to complete during the week. I am tweaking this a bit and posting 5 categories with two (sometimes three) actions to be done. (h) is for home and for work. I will put a line through the task and date it when I am finished. Go here to link up your Goals. Review from last week. I did terribly regarding my exercise and decluttering tasks. For both categories my goals were too big a jump. I have to remember baby steps. So I will try baby steps for both categories for this week. What tips do you have for making prpgress on your goals? Her plan is to post 5 things to complete during the week. I am tweaking this a bit and posting 5 categories with two (sometimes three) actions to be done. (h) is for home and for work. I will put a line through the task and date it when I am finished. What’s on your goal list for this week? Do you plan by category? How do you motivate yourself when your energy or motivation is flagging?